... and even though they've had such an unexpectedly fabulous year, it seems that some of them at least, agree with me! So now I've finished reading At Home and I'm halfway through Toni Jordan's debut novel, Addition. Grace, the narrator, has an obsession with numbers, especially the number 10. She counts everything - steps to the supermarket, bristles in her toothbrush. She has to take exactly 10 strokes to wipe down the table; she cuts her fruit into 10, and exactly 10, pieces. I feel sympathetic toward Grace because I reckon I am a tiny bit the same. Not that my life is ruled by numbers, but there are certain things I need to be just so, or I feel uneasy. I can't relax with an open drawer or wardrobe door in the room. I like the dishwasher stacked in a certain order. I can't leave my bed unmade. I have a complex 6-day haircare routine. I don't like to share my towel or toothbrush or my pens, though it's almost impossible to avoid this in a family home. I've recently realised that I don't care to share a suitcase either, even with my beloved on a romantic weekend. I know it doesn't make sense, but I just don't wanna. I differ from Grace in that I don't need these rules to keep panic at bay, but order comforts me. However, there are other things I will cheerfully let slide. Flowers can stay dead in a vase for weeks. Notices remain unreturned to school long after they're due. Dust doesn't bother me. And I don't feel compelled to wash and minutely sort every piece of rubbish, as, for example, my father does*, or keep a record of all household expenditure on a spreadsheet, as does my beloved**. Maybe we are all slightly obsessive about something, it's just that we're all obsessive about different things. So what's your slight obsession? ** My beloved points out that I can also leave the vacuum cleaner sitting in the hallway for up to a week. Hm, this appears to be true. I love obscure facts, and I love houses, and I love Bill Bryson. So the combination of all three in Bryson's At Home has proved perfectly irrestistible. 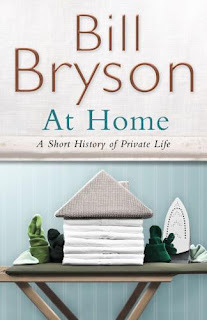 This delightfully corpulent book is sub-titled "A Short History of Private Life," and in it, Bill Bryson rambles through his English country house and along the way, wanders through the history of domestic comfort -- so far he's covered (among many other topics) the story of electricity, the telephone, landscape gardening, mice, sperm whales, tea and servants. There is a fascinating fact or anecdote on every page (often many more than one...) and the chuckle value is high, as is the "wow, I never knew that" factor. Did you know that lobsters used to be so common round the coasts of Britain that servants "sought written agreements from their employers that they would not be served lobster more than twice a week"? That the aspidistra was uniquely immune to the ill-effects of gas lighting, hence its ubiquity as a Victorian houseplant? That caravans of camels up to seventy miles long carried salt across the Sahara from Timbuktu to the ports of the Mediterranean? That despite widespread panic over rabies-carrying bats in the US, more people die from food poisoning at church picnics every year than from the entire history of human contact with bats? I gleaned each of these tidbits from opening the pages of At Home at random. So far, Bill and I have reached the study; there's only the garden and the upper floor to go before our tour concludes. I'll be sad when it's over. Many of our neighbours have backyards with space to run or kick a ball, a clothesline and a lemon tree; others have very productive yards, with vegetables and chooks. Some people have made their houses so big that there's hardly any backyard left. But our garden is full of trees. The couple who owned the house before us collected seeds while bush-walking (someone once told me, very disapprovingly, that this is actually illegal; still, it's a bit late now) and planted them here, so we have a patch of bush in the middle of the suburbs. Lorikeets and wattle birds visit our flowering gums; the tops of our trees tower high above the back fence, visible from far away. The glorious lemon gum in our front yard scents the whole street. After the magnificent rain we've had this winter, the garden is flourishing and everything that can flower, is flowering with exuberance. And this weekend our wonderful friend Matt arrived with a box full of new plants, to make our garden even better, and he got up on Sunday morning and quietly went out and planted them.